The goat cheese pastry has a hint of fennel in it. If you have leftover dough, roll it out and cut into biscuits to serve another time. 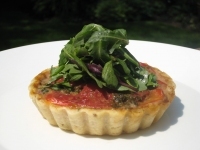 The tartlets make a wonderful first course. Combine goat cheese, butter, flour, salt and fennel seeds in a food processor and pulse until dough just begins to come together. Remove dough to a bowl and form into a ball. Roll dough out on a lightly floured surface and cut into 6 4-inch rounds. Prick each round with a fork. Place rounds on a baking sheet and bake 10 to 13 minutes or until pastry is golden. Cool on rack. Salt the tomatoes and combine with olive oil and basil in a bowl. Season with pepper. Place biscuits on individual serving plates and top with tomato slices, in a tower if possible. Toss greens (except basil) with olive oil and lemon juice and season with salt and pepper. Top or surround tomatoes with a small quantity of salad. Garnish with basil leaves. Serves 6.